For the second consecutive year, Alabama and Clemson clash for college football’s national championship. Will Monday’s result be different from last year’s 40-45 Crimson Tide victory? Like that last night in Florida on Spring Break before you head back to somewhere cold and miserable after a (insert anywhere from 8- to 16-hour drive), college football gives us one final evening before it sadly disappears from our consciousness Monday night. On the upside, tonight’s game looks potentially like the best incarnation of College Football Playoff Championship games to date (all three of them), as red-hot Clemson re-tangles with always scalding Alabama in a rematch of last year’s game won by the Crimson Tide. The story lines are abundant and obvious. Is this Alabama team the best of all time? You could make the case, but they’d need to win. What’s different this time around versus last year for Clemson? Health, for one. It’s rare we get the opportunity to see a rematch, mostly because the grind to get back there for both teams in any sport, let alone college football with its annual oddities and the reality that college humans aren’t wired to be consistent yet. So let’s enjoy one last howl at the college football moon before we pack the rental and head back to the cold wasteland of the offseason. While turnovers weren’t a staple of Alabama’s success in the regular season, they won five games in which they did not win the turnover battle. But against Washington’s elite offense, turnovers were the key to actually winning. Late in the first half, mired in a 10-7 battle that looked like it could go either way, the Tide got a 26-yard pick six from Ryan Anderson that took the wind out of the Husky sails, tossed them in a paper shredder, and then wrapped them up for post-game confetti. The Tide won that turnover battle against the nation’s top turnover margin team, 3-0, en route to a sometimes sluggish 24-7 victory. Consistency in defeating Clemson emerges in stopping their run game. In their lone loss to Pitt, the Tigers ran for all of 50 yards and zero first downs in spite of scoring 42 points. It was thought that Ohio State stood a good chance with their stout run D, but Clemson shredded them for 205 yards. Alabama held Washington to under two yards per carry, and while you can’t expect that against Clemson, they without question will need to do much, much better than Ohio State did. Lastly, and this shouldn’t be a problem with Alabama like it was for Ohio State, they’ll need to commit to the run game better. The Buckeye offensive line got destroyed and never tried to change that narrative, rushing only 11 times with a non-quarterback. Bo Scarbrough, on the other hand, put Washington away with a 180-yard performance that was capped off by a “let’s just get a punt out of here” drive backed up inside their own five that resulted in a 68-yard TD run. The big question is how the play-calling will go now that Lane Kiffin has been booted and Steve Sarkisian is taking over offensive coordinator duties. It’s unprecedented to let go of a coordinator before such a game, but if anyone can pull it off like it never happened, it’s Alabama. Simply put, Deshaun Watson needs to be as special as Deshaun Watson can be, all game. 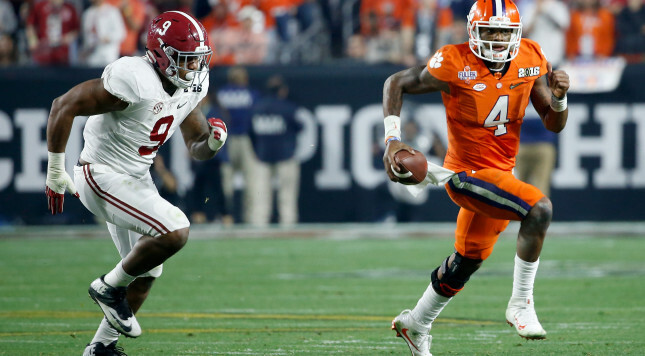 The semifinal matchup against Ohio State wasn’t even as close as the 31-0 score (if that tells you anything about that snoozer), but Watson made a few terrible throws that resulted in interceptions. OSU was never able to capitalize, mostly because their offensive line was being terrorized. Clemson held them to 215 total yards. The Tigers will also need to replicate Washington’s success on third down, where the Tide were held to 4-for-14 in converting. Not much is ever really made of Clemson’s rush defense, but it’s top 20 in the country, though not significantly above Washington. That said, it’s on the Clemson offense to do things that Washington could not, improvising and creating broken plays to success when the original play breaks down. If there’s a vice in anything Nick Saban (and there really isn’t), it’s that in the rare times his teams have struggled (see: not this year), it’s on broken plays — specifically where the quarterback can scoot with his feet. If Watson can avoid turnovers that the Tide will most certainly be more willing to capitalize on than Ohio State was, and he can create a few special long plays when the original one breaks down, Clemson has the chops to keep Alabama from running away with the game on offense. This seems like we’ll see one for the ages. Expect Clemson to load up to stop the run (similar to against Ohio State) and force Jalen Hurts to make throws that J.T. Barrett simply couldn’t make to win the game. Clemson will make one careless mistake in the red zone and Alabama wins a nail-chewer. Crimson Tide 24, Tigers 21.